I’ll try and explain what Amazon Go is without sounding a note of incredulity and rolling my eyes. It’s a shop where shoppers submit to constant surveillance for the slim reward of not having to line up to pay. Instead, they enter the shop by identifying themselves via the Amazon app on their smartphone, and their shopping is then charged to their account. 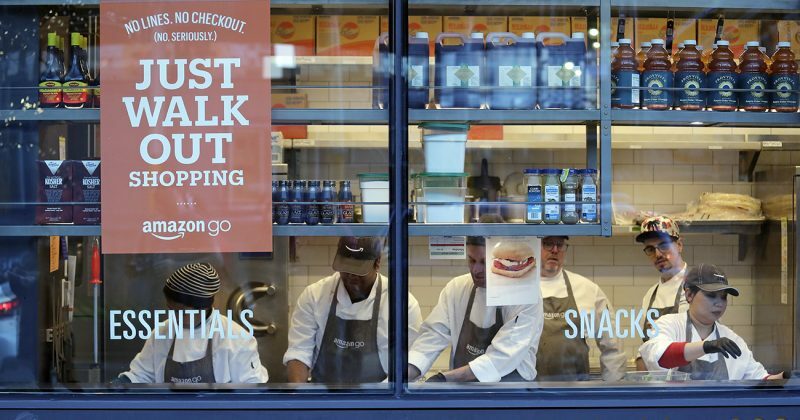 The economics of Amazon Go define the tech industry; the strategy, though, is uniquely Amazon’s. Most of all, the implications of Amazon Go explain both the challenges and opportunities faced by society broadly by the rise of tech. Fixed costs, on the other hand, have no relation to revenue. In the case of convenience stores, rent is a fixed cost; 7-11 has to pay its lease whether it serves 100 customers or serves 1,000 in any given month. Certainly the more it serves the better: that means the store is achieving more “leverage” on its fixed costs. In the case of Amazon Go specifically, all of those cameras and sensors and smartphone-reading gates are fixed costs as well — two types, in fact. The first is the actual cost of buying and installing the equipment; those costs, like rent, are incurred regardless of how much revenue the store ultimately produces. Just as Amazon built amazingly scalable server technology and then opened it out as a platform for others to build websites and apps upon, so Thompson sees Amazon Go as the first move in the long game of providing technology to other shops/brands. In market after market the company is leveraging software to build horizontal businesses that benefit from network effects: in e-commerce, more buyers lead to more suppliers lead to more buyers. In cloud services, more tenants lead to great economies of scale, not just in terms of servers and data centers but in the leverage gained by adding ever more esoteric features that both meet market needs and create lock-in… [T]he point of buying Whole Foods was to jump start a similar dynamic in groceries. The political dilemma embedded in this analysis is hardly new: Karl Marx was born 200 years ago. Technology like Amazon Go is the ultimate expression of capital: invest massive amounts of money up front in order to reap effectively free returns at scale. What has fundamentally changed, though, is the role of labour: Marx saw a world where capital subjugated labour for its own return; technologies like Amazon Go have increasingly no need for labor at all. He does have a point, though, and reading Inventing the Future: Postcapitalism and a World Without Work convinced me that even ardent socialists should be advocating for full automation. As routine and procedural work gets automated, human work will be increasingly complex, requiring permanent skills for continuous learning and adaptation. Creativity and empathy will be more important than compliance and intelligence. This requires a rethinking of jobs, employment, and organizational management. Some people worry that there won’t be enough jobs to go around. However, the problem isn’t employment, the problem is neoliberalism, late-stage capitalism, and the fact that 1% of people own more than 55% of the rest of the planet. Next Where would your country be if the world was like Pangea?